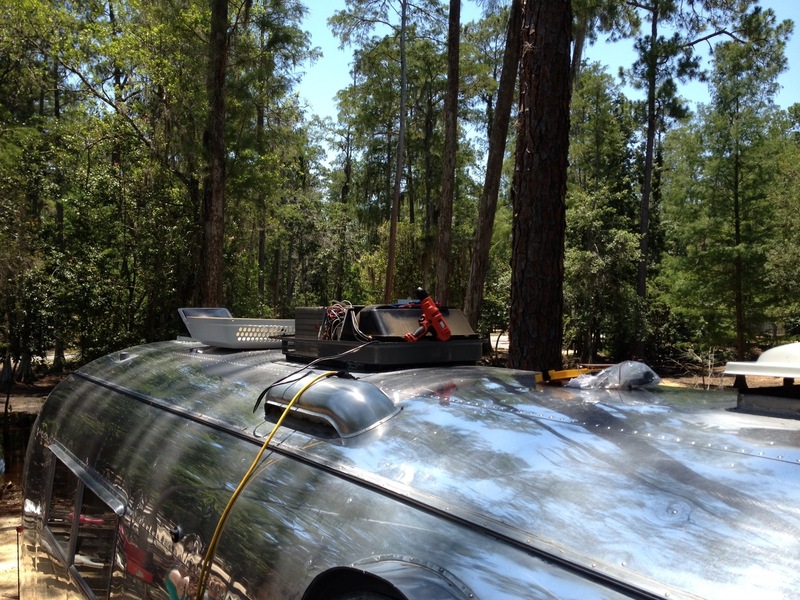 Journey across the US not without problems | 1960 Airstream Ambassador Blog! We are halfway on our journey across the US and back. We have run into a few issues with water leaks from Tropical Storm Debby, refrigerator being too warm, and dripping AC condensation. Some items I was able to rectify easily. The dripping AC reduced dramatically whenever the trailer was level, the warm fridge needed to be set to a higher cool setting and the CLC button turned on. The CLC button is for high humidity weather which we started hitting after Texas. I also starting using my chimney vent exhaust fans. This brought the warm temps down to normal ranges. The biggest problem was yet to come. Once we hit Florida we landed right in the middle of Tropical Storm Debby. The storm went on for days and let a good amount of water into my dining room window. The window needs to be removed and reseated with new bedding tape. This usually means replacing the glass as you generally have to break it to replace it. The rain stopped but I purchased some aluminum tape to tie me over if needed. Oh, yeah, that wasn’t the bigger problem. Just as the rains started to stop and the sun started to heat up, my A/C started having problems running. The lights would dim and the A/C would grumble. I checked the power at an outlet and found the voltage would drop to 96vac. I started suspecting the campground power. I was hoping anyway. Disney was pretty good about it. They came out at 9pm and replaced the outlet and breaker. He pointed out some corrosion on my neutral pin and cleaned it up. Luck was not with me though. 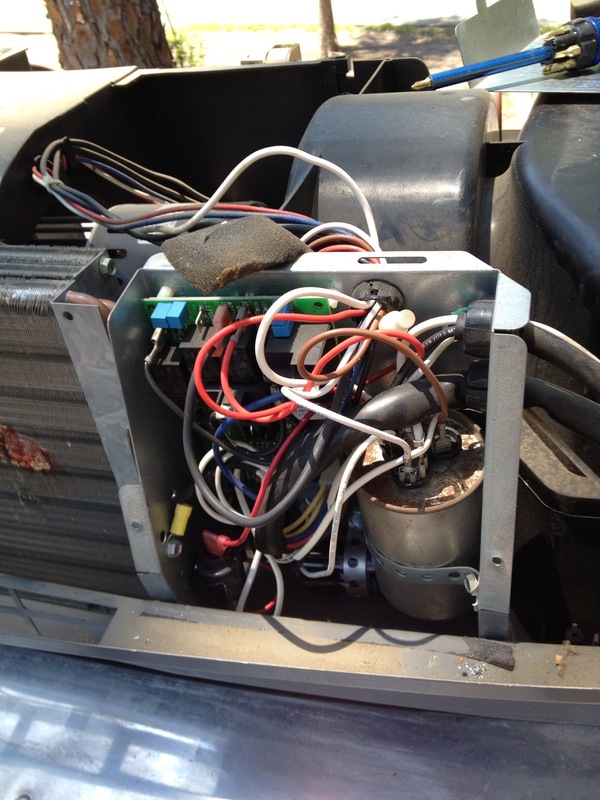 I still had the same problem, large voltage drop, A/C not starting. I started looking at my breaker box, and inlet plug and cable. I decided to get up early the next morning and head to a Camping World for a new 30amp line cord for the trailer. Well, $79 later I STILL had the same problem. At this point I started suspecting my A/C was going out. Not good with over two weeks to go on our trip and being in central Florida in the summer. I was wishing Debby would come back. I was starting to look into back up plans like buying a $100 window A/C unit and propping it in the front window. I’m sure my fellow resort campers would love that. I decided to email a certified RV mechanic who has been very helpful with his knowledge to fellow Airstreamers. I explained my findings and all that I had done and told me it sounded like my start capacitor and PTCR were burnt. He also told me that Dometic makes a Hard Start repair kit for this that should be available and any RV parts store. I decided to give it shot before the hillbilly fix. The next morning I laid my hands on the Hard Start Kit. 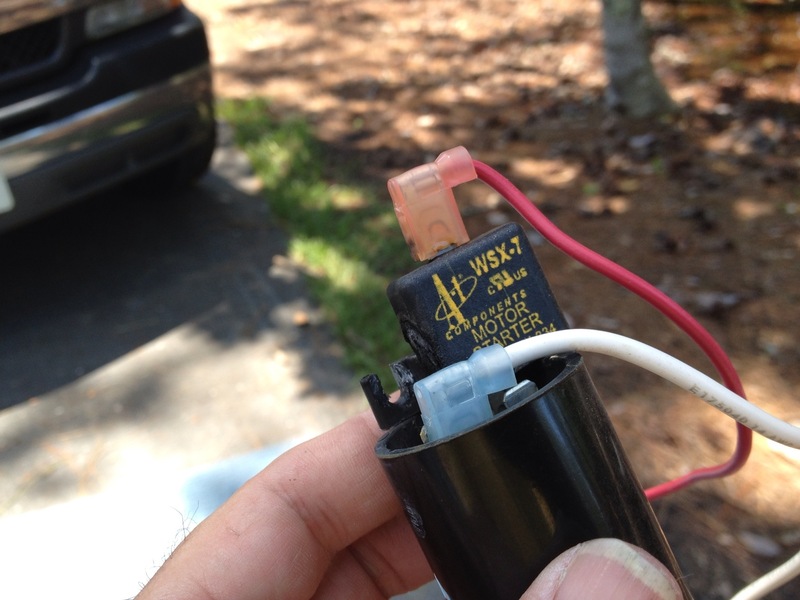 The kit included a new capacitor a PTCR, some strapping material, screws, and some wire. I needed a drill, bits, and some basic hand tools. Didn’t quite have everything I would need, so off to Lowes. Back at the campground I had to get on top of the trailer. I really didn’t want to buy a ladder for this and haul it back to CA. So I parked my truck so close it was touching the side of the trailer, gently of course. I gathered my tools and stood on top of my truck, then climbed on to the Ambassador. I don’t recommend this by the way. I followed the instructions closely since I don’t know anything about air conditioners. The instructions are pretty clear and easy to follow. Here is the area with the parts I needed to get access to. The start capacitor is in the very bottom, black with a metal strap holding it in. After I got this access cover off, I could smell the burnt electronics, that I had a slight whiff of inside the trailer. Once I pulled the old starting capacitor off, I could clearly see the burnt PTCR. The original PTCR was mounted right on the capacitor. The replacement parts had a separate PTCR which required a new mounting hole to be drilled. Here is the old burnt one. After mounting and wiring everything as per the instructions, I fired it up with my voltmeter ready to take a reading. Since its a heatpump it takes three minutes to start once it’s turned on. When your waiting, that’s the longest three minutes ever. I had a reading of about 116vac, when the compressor kicked it, the voltage dropped to about 112vac, and kept humming along! Seconds later cold air was blowing! Success! I would not recommend this field repair to anyone, but I really needed a working A/C in Florida now. It’s hot and humid here and we have some pretty hot states to travel through to get back to CA. Hopefully with the improved parts, it will last for years to come. This entry was posted in on June 29, 2012 by Tim.